The summer holidays are almost over, and we all need something to look forward to. Well, The Norwich Science Festival is not too far away, and we have the details so you can start making plans! From ugly animals and dinosaurs to robots and our future world – over 130 events announced for Norwich Science Festival, so there will be plenty of activities for everyone. The 2018 Norwich Science Festival brochure is now out, with over 130 events covering nature and the environment, technology, engineering, medicine and health, engineering, astronomy and space, physics, chemistry, and the cutting-edge work by scientists at Norwich Research Park. Plus new this year is a day dedicated to celebrating our oceans, seas and rivers – from aquatic wildlife to our responsibility to protect the marine environment. The eclectic programme urges people to discover ‘our future world’, and explore how developments in science and technology will shape our future, and what we can do to help make it sustainable. The brochure was launched at The Forum, Norwich, with the help of a striking sculpture of a moorhen made out of recycled materials, courtesy of headline sponsor Anglian Water. The artwork is made from parts of abandoned shopping trolleys, washing machines and bicycles, and sits on a nest of plastics collected from the region’s rivers and beaches. Highlights of this year’s Festival include Chris Packham; Maddie Moate; Professor Alice Roberts; explorer Benedict Allen; Angela Saini and a women in science panel; and the Space Descent with Tim Peake VR Experience Tour Bus – where you can experience in virtual reality the incredible descent from the International Space Station back to Earth, voiced by astronaut Tim Peake. There’s also science-inspired exhibitions, concerts and theatre shows, plus every day during the Festival, there’s free family-friendly activities, hands-on fun and talks at The Forum, for all ages. The Festival is coordinated by The Forum and a partnership of organisations and institutions, including Norwich Research Park and the University of East Anglia, who have more than 100 scientists taking part. 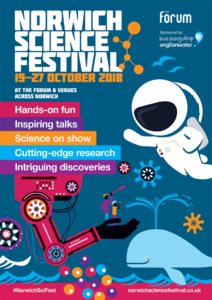 Visit https://norwichsciencefestival.co.uk to see all events and book tickets, or pick up a brochure from The Forum, Norwich TIC or venues across Norfolk. You can also download a copy of the brochure from the website too.